You know when a 9×13 cake disappears in one sitting with only four eaters that it has to be good. This is quite fabulous. I think they serve something like this at Cafe Rio, but I’m willing to venture that this is much, much better. With a little cinnamon on top, for effect. For milk mixture: Pour the condensed milk into a large microwave-safe bowl and cover tightly with plastic wrap (if it’s not large enough, the mixture will bubble over. I had multiple problems with this, and recommend using a very large bowl. Tell me if it works). Microwave on low power, replacing the plastic wrap and stirring every 3 minutes. After 9-15 minutes, the mixture should be thicker and darker. In another bowl, combine evaporated milk, cream, and vanilla. Slowly whisk the cooked sweetened condensed milk into this mixture and set aside to cool. For cake: Preheat oven to 325 and grease and flour a 13×9 baking dish. Combine dry ingredients in a small bowl and set aside. Melt the butter and milk in a small saucepan over low heat. Remove from heat and set aside. In a standing mixer, beat the eggs for 30 seconds, then add the sugar slowly. Increase the speed to med.-high and beat for 6-7 minutes. Reduce speed and add the vanilla, and then the butter mixture. Add the flour in 3 additions, scraping the bowl after each addition. Pour batter into prepared dish, and bake for 30-35 minutes, or until a toothpick comes out clean. Let cool for 10 minutes on a wire rack. After ten minutes of cooling, use the blunt end of a skewer to make holes about 1/2″ apart all over the cake. Pour the milk mixture slowly over the cake until it is completely absorbed. Let sit at room temperature for 15 minutes, then refrigerate uncovered for at least 3 or up to 24 hours. For frosting: Beat cream, corn syrup, and vanilla to soft peaks with a mixer. Frost and serve. Note: I had trouble with the dulce de leche in the microwave, and I would love to hear how it worked for others. I also didn’t frost the cake–it seemed a little like gilding the lily, but perhaps it would just make a great thing even better. Do you have a great salsa recipe? my sister recently made a tres leches cake that was divine. she didn’t do a frosting, though. she whipped cream and added a little bit of cinnamon. so good! I made this on Saturday and it was so good. I ran out of vanilla & so substituted some almond extract in the cake, which turned out to work well. I didn’t have any cream on hand, though, so I substituted whole milk in the milk mixture & skipped the frosting. When I put the milk mixture in the microwave, I forgot to put it on low power. Fortunately, I remembered after a minute, and it was fine. It never got as thick as commercial dulce de leche, but it did get darker and thicker & was quite delicious. I used the largest bowl I own, so thanks for that tip. It was a really easy way to make a caramel sauce. I will definitely make this again. Especially since the glass bowls cleaned up completely in the dishwasher! I think you may be able to just buy the commercial dulce de leche as a sub–nice to hear that substitutions worked so well! Mmmmm. I admit to being quite a fan of Tres Leches and this one didn’t disappoint – which is a good thing, considering it was our Valentines dessert. For kicks, I substituted half of the cream for the caramel sauce with coconut milk and added a wee bit of coconut extract to the whipped cream frosting. I’ve never actually heard of thickening the s.c. milk – but a nice touch! Mine didn’t really reach the dark dulce de leche color or consistency but I’m not sure I’d want that intense of a caramel flavor. (And goodness knows how I love dulce de leche.) I feel a definite repeat of this recipe coming up! Wow. I love your ideas. Definitely need to try the coconut soon . . .
Hello there, You have performed an excellent job. I will definitely digg it and individually recommend to my friends. I am sure they’ll be benefited from this website. This recipe is from America’s Test Kitchen and I just made it this weekend. 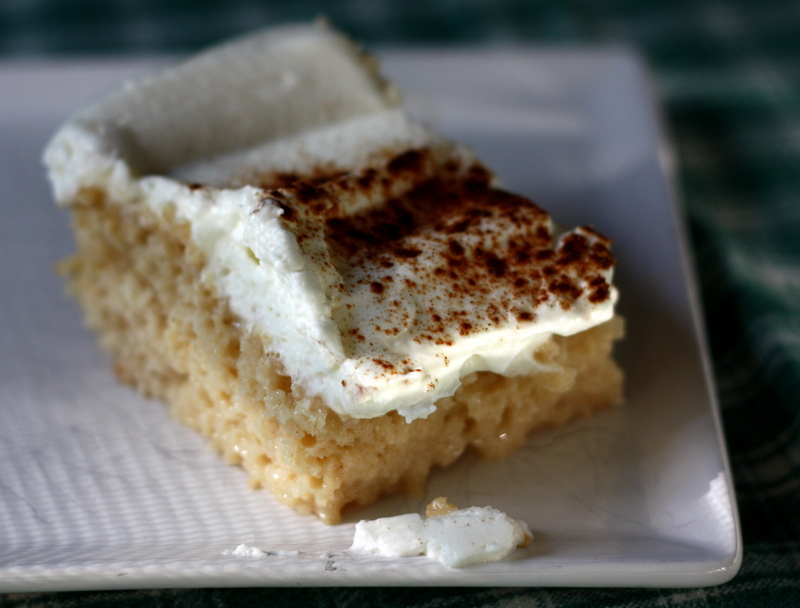 I have made Tres Leches before many times with other recipes but always like to try a new one out. This was the first time I had to microwave the condensed milk and it made sense to me to make it a bit thicker and also to make it more Dulce de Leche tasty. The cake though was a bit strange. It came out golden and beautiful and all toothpicks came out dry, and yet when I did end up tasting the dessert it seemed dense in the middle, like it hadn’t finished cooking??! I soaked it in the Milk Mixture overnight and when I went to take it out to let it sit before frosting, I found that the cake had soaked all that it could and yet there was a lot of liquid on the sides, too much for my taste. I always top it with meringue but liked the fresh whipped cream because Tres Leche is so sweet that it helps to calm it down.